This festive event rings in the holidays in true Hawaiian style: with entertainment by award-winning musicians; mouth-watering food; free wine tasting; and a chance to shop for only-on-Maui gifts for the whole ‘ohana. The ranch store and winery will offer the biggest specials of the year on all branded merchandise, wines and locally made items. Giving Grammy-winning sparkle to the day will be slack key guitar master Jeff Peterson, performing together with Nathan Aweau. The two will premier their brand new album “Mamo,” not yet released in the U.S. but available for the first time at this special event! The CD features Hawaiian music with jazz interpretations, ranging from hula classics to original songs. One of Hawai‘i’s most versatile and talented musicians, Peterson is the son of an Ulupalakua Ranch paniolo, with music that reflects his passion for his heritage. Formerly a member of Hawaiian supergroup HAPA, Aweau has been named three times as Na Hōkū Hanohano “Male Vocalist of the Year.” Peterson and Aweau will perform on the winery grounds from noon to 1 p.m. and 2 to 4 p.m.
More Maui talent will shine with respected Kumu Hula Uluwehi Guerrero and Gale Wisehart leading Maui’s Community Choir, Na Leo Lani O Maui, in concert from 1 to 2 p.m. Guerrero’s Halau Hula Kauluokala will add the language of dance to this gift of Hawaiian culture. And it wouldn’t be the holidays without Christmas carols by the keiki! Seventh- and eighth-graders from the Samuel E. Kalama Intermediate SchoolUkulele Band of Makawao will perform holiday favorites at 11 a.m., with a special appearance by the sixth-grade semester band. The young musicians are led by director Benny Uyetake, another talented local favorite who will perform at the Ulupalakua Ranch Store from noon to 3 p.m. He will also be singing “Mary Did You Know” with Teri Garrison on this event. Shoppers at “Ulupalakua Sparkles” will find plenty of uniquely Maui gift ideas: like the 2009 Plantation Red Maui County Syrah, a limited estate wine made from Syrah grapes handpicked from the slopes of Haleakala, offered for a final tasting on this day. To enhance the shopping spirit, both the winery and ranch store will offer 25 percent off all logo wear and made-on-Maui items! And what could gift could say “Maui” more than a sweet Maui Gold Pineapple, shipped straight from the field home to friends and family? Hali‘imaile Pineapple Company will provide samples, sales and information about their juicy product (which just happens to be the source of Maui’s Winery pineapple wines!). Maui Cattle Company will also be on hand, serving up the Ranch’s famous Ulupalakua Steak Chili and Chow Fun. Formed in 2002 by a group of local ranchers, the company prides itself on all-natural, premium Angus beef that is raised on Maui and full of flavor. The good grinds continue inside Ulupalakua Ranch Store Deli & Grill, with burger specials (try the Ulupalakua Elk Burger); sandwich specials (grilled marinated veggie and roasted sliced beef); plate lunches (beef brisket and sweet-and-sour pork made with Maui Gold Pineapple); salads and more, from 11 a.m. to 4 p.m.
Other treats include delicious offerings from graduates of the Ka Ipu Kukui Fellows Program, a leadership program at University of Hawai‘i Maui College. Proceeds benefit the program. With amazing food, fun, shopping and music, Dec. 4 is sure to be a day that sparkles! 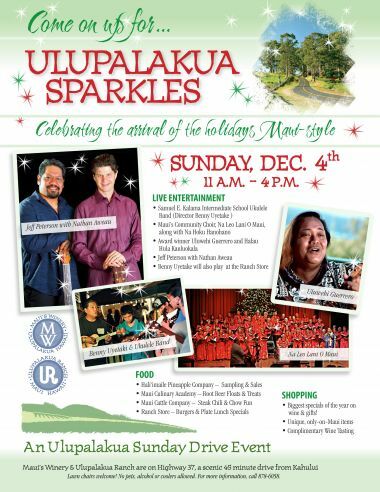 “We look forward to sharing the Ulupalakua holiday spirit with everyone at this very special event!” says Paula Hegele, president of Maui’s Winery.